Forty years ago on April 30 the South Vietnamese capital city of Saigon was finally liberated from US occupation and from control by its South Vietnamese puppet administration. In the Western media it became known as the ‘fall of Saigon’. To the overwhelming majority of Vietnamese and their international supporters it is ‘Ngày giải phóng miền Nam’, the Moment of the Liberation of the South. Saigon is now Ho Chi Minh City. The victory of the National Liberation Front and the People’s Liberation Army under the leadership of the Vietnamese Communist Party was the culmination of a prolonged and heroic struggle for national liberation which led to socialist revolution. It involved the defeat of two major imperialist powers, firstly the French colonialists and then, after they were effectively routed at Dien Ben Phu, this was followed by a defeat of the US imperialists. The US had corralled nearly all the other imperialist forces in the world to support its military assault on the whole region of ‘Indochina’ in the vain attempt to defeat the liberation forces. The war itself represents one of the most dogged and heroic mass struggles in human history. Over three million Vietnamese were killed in the war and up to half a million Cambodians and Laotians were killed as the US attempted to destroy all potential areas of support and supply lines for the insurgents. Almost as many were maimed. The 58,000 US military that were killed were a tiny number by comparison, but alienated a generation of Western youth and had the effect of heightening US domestic opposition to the war. Estimates remain contentious but, at a minimum, the US dropped at least four times as much tonnage of bombs on the region as were used in the whole of World War II. There were many who hoped at the time that the victory in Vietnam would itself cause a new wave of revolutions in the region and beyond. However, the liberation of Saigon should more properly be seen as the last great victory of the revolutionary impulse created by the defeat of the Nazis at Stalingrad. The Red Army’s crushing of the Nazis was followed by the sweep through Eastern Europe and the overturning of capitalism in half of it. It also led to the Chinese Revolution in 1949. This victory over the most naked form of imperialism – fascism – was a necessary condition for both the success of the global movement for decolonisation after World War II and the victory of the Chinese Revolution in 1949. The Chinese Revolution was sustained in both a political and material sense by the existence of the Soviet Union. The foundation of these successes was the Russian Revolution in 1917. This had combined both urban, that is proletarian, insurrection and an agrarian land war conducted by the peasantry. The proletarian uprising was the first, decisive blow. Prior to the Russian Revolution Lenin was at pains to point out that the precise combination of events and forces could not be foretold in advance. In Two Tactics of Russian Social Democracy in the Democratic Revolution written in 1905 he argued that a certain combination of the proletarians and the peasants would participate in the coming revolution but that the precise balance between the two, and who would initiate the decisive advances could only be determined in the course of the struggle. Lenin identified the algebra of social forces for all future revolutions. From this point onwards Mao’s focus was how the Chinese Communist Party could ‘march at the head and lead’ the peasantry to a victorious socialist revolution. This was finally achieved in 1949, after millions of dead in war and following massacres by the Kuomintang, the invasion by the Japanese Imperial Army and the attacks by the warlords supported by the Western imperialists. This was a momentous event in world history and resonated in particularly in Asia, where World War II had barely ended before the Korean War began in 1950. This pitted the People’s Republic of Korea government, supported by both the Soviet Union and China, against US imperialism and its allies. The ‘Cold War’ was largely confined to the West; in the East it was mainly a hot one. 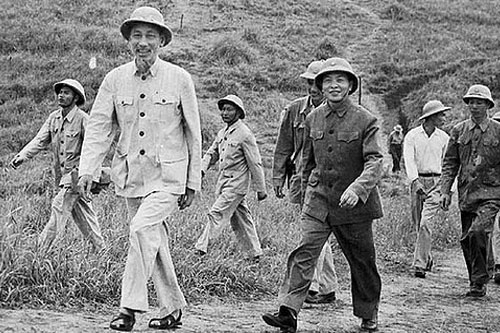 In Vietnam itself, under the revolutionary leadership of Ho Chi Minh and General Vo Nguyen Giap the Viet Minh had routed the Japanese forces that had occupied the country and following the Second World War stood at the head of the national government. But the US and British imperialists aimed to re-install the French colonialists in Vietnam. They were Vichy-era colonialists who had capitulated to the Japanese invasion in return for continued administration of ‘Indochina’. It was a putrid regime that had in effect been the puppet for two sets of fascists, the Nazis and the Japanese militarists. It was only when the British and US plan failed and the French forces were routed at Dien Ben Phu that the US became the prime opponent of the Vietnamese liberation forces. The concrete tactics of the great Vietnamese revolutionaries were entirely their own. But the framework for the success of the Vietnamese revolution had been originated in the combined theory and practice of the Chinese Revolution, whose main author was Mao. This was a peasant war led by a peasant army which gradually surrounded and defeated the imperialists and their puppets in the urban centres. The Vietnamese Revolution did not usher in a new wave of revolutions either in the region or across the globe. The fundamental reason for this was material exhaustion of the whole region and of the revolutionary forces within it. By the Moment of Liberation of the South the war had been raging continuously for 35 years. The US had so devastated the economy and society that the entire focus was on rebuilding, and the toxic impact of the US armed intervention is still present in Vietnamese society. Thousands continue to be born to this day with severe disabilities because of the effects of the chemical weapons used by the US in the war. But it was also the case that the Vietnamese revolution ushered in no new form of revolution that those fighting for national liberation and socialism could emulate. Quite independently, Tito in Yugoslavia had been obliged to disregard Stalin’s diktats and carry out a successful revolution based mainly in the countryside. And, initially outside the communist movement, the Cuban revolutionaries had adopted a similar approach. This did inspire a whole generation of revolutionaries, primarily in Latin America but also beyond. Instead, the international impact of the Vietnam was felt mainly in the West. It created the so-called ‘Vietnam Syndrome’ where for a period the US was much more reluctant to be the primary combatant in its own wars after the defeat. This was related to the rediscovery of the Western left of its internationalism and the creation of mass anti-war and anti-imperialist movements against their own governments’ military adventures. It was a conscious aim of the architects of the first Gulf War in 1991 to break the Vietnam Syndrome. There has been a deal of propaganda in the West ahead of the 40th anniversary of the victory of revolution. The barbaric nature of the US intervention, including indiscriminate bombing, bombing of neutral countries and mass scale of chemical weapons deployment are largely glossed over. But these are not ‘regrettable incidents’. They say a leopard cannot change its spots. These are imperialism’s spots, the repeated tactics they are prepared to use as they seek to dominate the whole world. Instead, the focus of the West’s propaganda is on modern Vietnam, which of course is not an earthly paradise, free of all problems and contradictions. Here, a more insidious line is pursued, one that suggests that Vietnamese Revolution was hardly worth it. This is the judgement of the liberals and the ultra-leftists who argue that, because MacDonalds operates in Vietnam capitalism now dominates. Vietnam operates what it calls the Doi Moi system of the ‘socialist-oriented market economy’ since 1986. It moved away from the Stalinist model of total central planning, entirely eliminating the private sector and inability to participate in the world economy which is what led to the collapse of the Soviet Union. The dominant sectors of the Vietnamese economy are themselves dominated by state-owned enterprises, including banks, energy, infrastructure and transport. The planned privatisations are all of minority interests, designed to bring in external expertise and help weed out corruption and revitalise failing enterprises. This is explicitly the Chinese model of economic development, in which the state sector predominates and the private sector is important but subordinate. Crucially, this allows the government to direct economic policy. As a result, the proportion of the population in poverty has fallen by two-thirds in the last 20 years. This means that 30 million Vietnamese in total have been lifted out of poverty. In the modern era capitalist societies are incapable of producing comparable results precisely because the realisation of profits in part requires the immiseration of the population. It is countries such as Vietnam and China, as well as many of the countries in Latin America which are reducing poverty. In the rest of the world, excluding these countries poverty is rising. The rising tide of capitalist development on a world scale is long over. Even the period of small-scale and partial reforms has at least been suspended. Instead, the socialist revolution in Vietnam demonstrates that for any lasting reform of even the most basic social indicators, the working class and its allies need to take power. The heroic endurance and bravery of the Vietnamese workers and peasants ensured they were able to do that, against the most ferocious onslaught from US imperialism and its allies. There are a number of Western videos that document the liberation of Saigon, a couple of which can be seen here and here.